In October 2015, The Little Red Rooster Blues Band was putting the final touches on its 6th CD (Hijinx & Tomfoolery) when lead singer Kevin McCann woke up one Friday morning with tingling in both hands. “I’d been feeling rundown, like I was getting a cold I couldn’t shake,” said McCann. He decided to go back to bed to nap. Later in the day, he visited a few Doylestown haunts, but made it an early night as the Doylestown based band had several gigs booked for the next day. On Saturday morning, he could barely get out of bed. “I couldn’t stand up straight, my back hurt, both hands were numb,” said McCann. By the end of the weekend, he was paralyzed from the neck down and was put on a ventilator. This was the beginning of a four month hospital and rehab stay followed by intensive outpatient therapy. 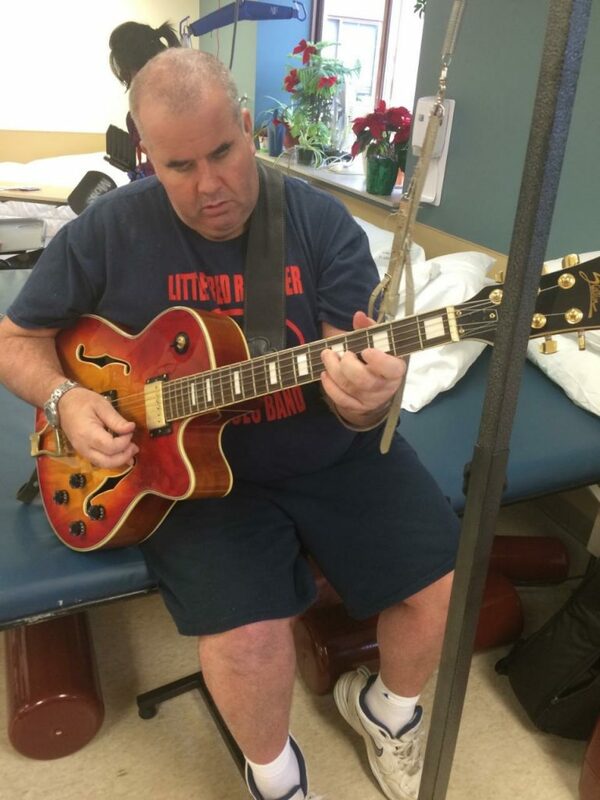 Kevin McCann was diagnosed with Guillain-Barre Syndrome. Guillain-Barré syndrome can affect anybody. It can strike at any age and both sexes are equally prone to the disorder. The syndrome is rare, however, afflicting only about one person in 100,000. Usually Guillain-Barré occurs a few days or weeks after the patient has had symptoms of a respiratory or gastrointestinal viral infection. Occasionally surgery will trigger the syndrome. Recently, some countries worldwide have reported an increased incidence of GBS following infection with the Zika virus. In rare instances vaccinations may increase the risk of GBS. 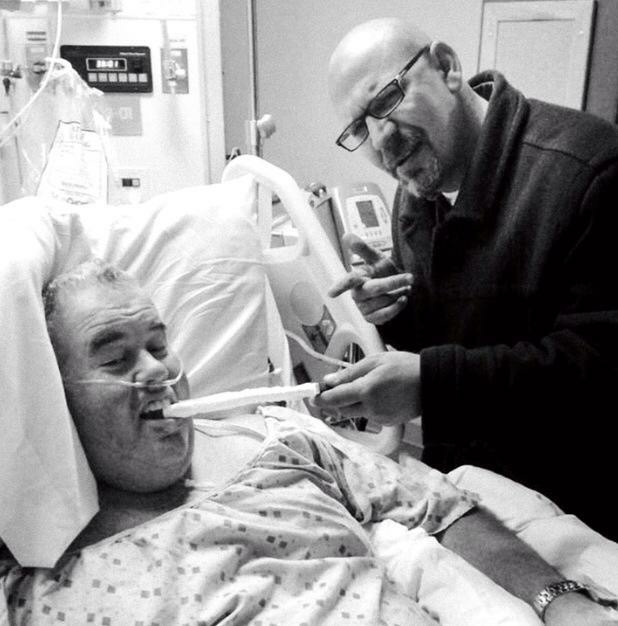 Kevin McCann & Dave Holtzman moments before being put on ventilator. Eventually, Kevin McCann slowly regain back control of his body again. He started coming back to gigs while in a wheel chair…then a walker…then a cane. His voice was back and even better than what it was before. His guitar playing was taking longer to get back to where he once was. 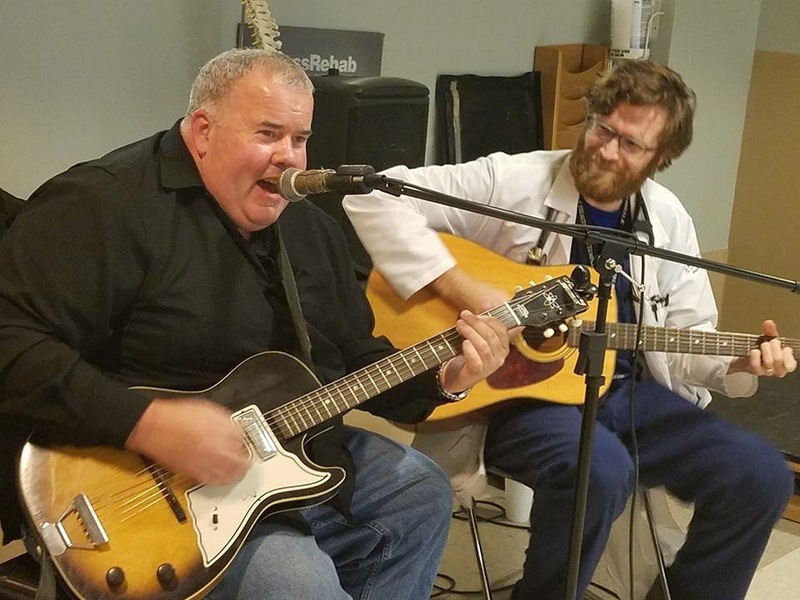 McCann was persistent in playing guitar. He played guitar with a makeshift sling on a mic stand. McCann with Drew Isleib (Moss Rehab) jamming. Fast forward to 2017… McCann is fully back to guitar slinging shape entertaining Rooster fans from far and wide. If you didn’t know this story, you wouldn’t believe it. Less than 2 years ago McCann was knocking on Heaven’s door (not to sound cliché) and I firmly believe it was his love for the Blues that kept him Alive.